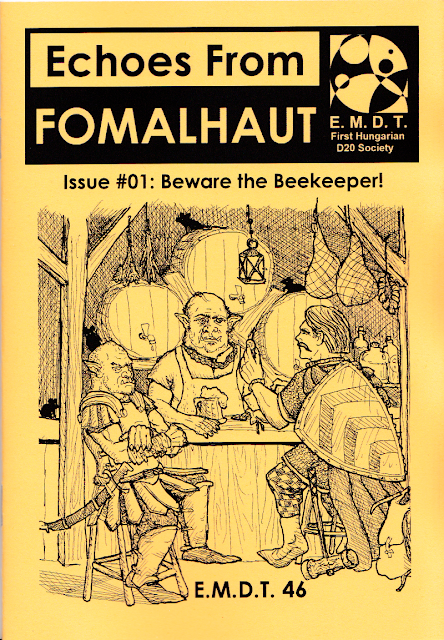 I am proud to announce the publication of the first issue of Echoes From Fomalhaut, my old-school fanzine. After a long time on the drawing board, the print version is available from the Shop. 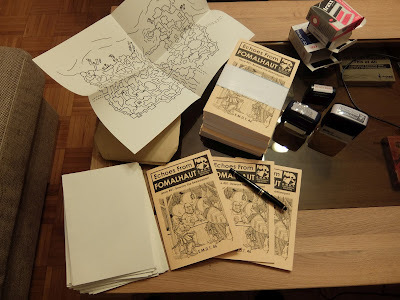 Echoes From Fomalhaut is an old-school RPG zine focused on adventures and game-relevant, GM-friendly campaign materials. Each issue is planned to feature a larger adventure module, accompanied by shorter scenarios, city states, and other things useful and interesting in a campaign. Rules-related material will be limited to a few pieces of interest. A long time ago, Judges Guild’s campaign instalments established the general idea, and that’s the road I intend to follow. A small city-state? An interesting wilderness area? An island ruled by a society of assassins? Guidelines for magical pools? That kind of stuff. The philosophy of the zine is to follow the “Creativity aid, not creativity replacement” motto, and to treat its materials as departure points – to inspire GMs without restraining them by spelling out every mystery and filling in every blank. The content will feature both vanilla and weird fantasy, mostly drawn from our home games, with occasional contributions by guest authors from the Hungarian old-school scene. Most of the articles will follow AD&D (well, OSRIC) conventions, but remain compatible with most OSR systems – and there will be detours. An average issue is expected to run 32-40 pages plus the cover. The print edition, produced in the A5 format, is set to ship with larger extras like fold-out maps or what have you; the PDF edition will include these as downloadables. I have always wanted to publish homemade game materials, an idea that has grown on me ever since I fell in love with the rough charm of Judge Guild instalments. I released my first PDF adventure in 2001, and the first printed one in 2003 (through my E.M.D.T. 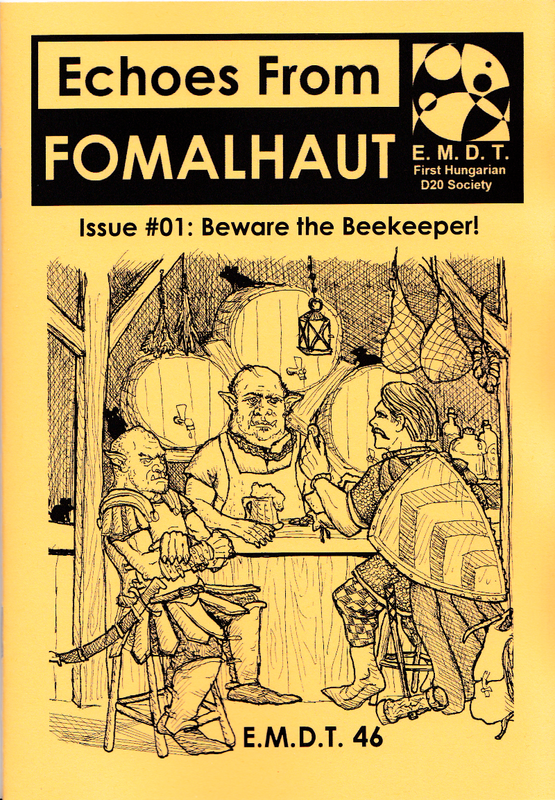 – First Hungarian d20 Society label – the first issue of Echoes is E.M.D.T. 46). Over the years, I have mostly stuck to free PDF releases and community fanzines (with the occasional detour, like the Helvéczia boxed set), but something has always been missing. This is an opportunity to fix that. Finally. The print edition is now available for order. A PDF/POD version will be published through RPGNow with a delay of a few months. A print issue sells for $8.00 plus priority shipping ($3.5 to Europe, $4 to the US and worldwide). The price for the PDF edition is expected to be set around $5. POD is still TBD. All buyers of the print edition will receive a free copy of the PDF edition at the date of its publication. This is slightly above the average in zine pricing (I did an Excel comparison of 39 OSR and indie zines, and they come out at $11.44 for print/worldwide), but gives you some 14,800 words worth of content per issue (not including the OGL and front/end matter), pays for the commissioned artwork, and Hungary’s prestigiously large tax wedge. I will also spend the proceeds on future publishing projects. Thank you indeed! I will mail it tomorrow. I just received my copy. Will read it later this eve! Looks great, do you have a Twitter feed so I can use that as a reminder? Unfortunately no - social media creeps me out, and it is bad enough I'm on G+ and Gmail. However, I am thinking about setting up a mailing list for people who'd like to receive updates. Will look into it. Hey Melan, I just finished reading through issue #01 and wanted to let you know that in my opinion it is a great product, exactly what I would want in a Zine! Entertaining read, interesting and gameable drop in content, and useful supplementary tables and items (Philtres and Dusts is fantastic). I can see myself using everything in this booklet! When is the next one ! Thanks, Gary! I will try to continue in a similar vein. :) Next release is a standalone module (a new, fully illustrated revision of the storied The Barbarian King), with the second issue of Echoes following early Summer. Did you seriously buy a cutting machine or were you kidding? Nah. Turns out there are two kinds with no compromise in between: the puny home models which can barely cut through a few folded pieces of paper without messing up the edges, and the industrial behemoths which start at the size of a small table. My printer's paper cutter is a thing of beauty - the calibration is done with lasers and it could cut up your average heavy-set game designer in a few neat cuts - but it weighs half a ton, and costs more than a good car. Those things look like military grade hardware. I have used one in the city to trim boxes full of printed pdfs. They charge €1 per cut whether it is for one book or twenty. The second time I needed to use it I asked if they would trim some booklets with their *laser cutter* and the lad had to explain (laughing) that the laser was only a guide. I`ve just been reading the complimentary PDF whilst awaiting the print copy. Great fun and if there is an echo it is not of Fomalhaut in my case it is of those early years of playing Empire of the Petal Throne. I can offer no higher praise. High praise indeed! EPT is my gold standard as game writing goes. Coincidentally, later issues from #03 on will start serialising the unpublished stuff from our City of Vultures campaign, which was half EPT homage (the rest of the influences coming from Steve Jackson's Sorcery!, Harold Lamb's Cossack stories, with a bit of Lankhmar thrown in). Putting it into print is one of the reasons I started the zine. Hello, very glad to see you have some actual printed material out. Despite having downloaded all of your other modules and accesories I am pretty much old school and much prefer an actual printed version. I am happy to say that you are one of my all time favourite game designers and I particularly enjoy the mythological flavor combined with the gritty and violent atmosphere of your game material. Is there any way to purchase these items without having to go through Paypal? Hi John, and thanks for your interest! Paypal is the only payment method currently available to me via my Bigcartel store, but if you can do bank transfer, I'll be happy to work something out. Please send an e-mail to beyond[DOT]fomalhaut[AT]gmail[DOT]com with what you need, and I'll send you an invoice.